Some sections are displayed on almost all screens. Those sections allows to set information or add information to an item of the element. This section allows to identify items of the element. This section contains information about item treatment. Depending on the element, this section may have a different name. This section allows to manage resource allocation to projects. Id Unique Id for the allocation. Resource Name of the allocated resource. Start date Start date of allocation. End date End date of allocation. Rate Allocation rate for the project (%). Click on to create a new allocation. Click on to update an existing allocation. Click on to delete the corresponding allocation. The icon indicates that allocation to project is closed. From project screen, click on the resource name to go directly to the selected resource. From resource screen, click the project name to go directly to the selected project. Rate Rate (in %) of the allocation to the project. Description Complete description of the allocation. Closed Flag to indicate that allocation in not active anymore, without deleting it. If the allocation is done on the screen «Projects», the field «resource» will be selectable. If the allocation is done on the screens «Resources», «Contacts» or «Users», the field «project» will be selectable. This field can contain a list of users, resources or contacts according to which screen comes from project allocation. The user profile defined will be displayed first. 100% means a full time allocation. Depending on which screen is used to manage project allocations, the behavior of fields will change. This feature allows to replace a resource by another. All tasks assigned to old resource will be transferred to the new resource with assigned and left work. Work done on tasks belongs to always the old resource. This section allows to manage assignment of resources to tasks. Only resources allocated to a project can be assigned to its tasks. The assignment function allows to define the resource function to task and the daily cost if defined. Assignment rate is used to keep some scheduling time for other tasks. For instance, if rate is 50%, the resource will not be planned more than half days on the task. A resource can be assigned more than once to a task. Allows to assign the resource to the same task, but with a different function (different daily cost). Allows to add extra work without modifying initial assignment. The scheduling process tries to schedule, the remaining work on the assigned task within the allocation to project period. The remaining work that can’t be planned is displayed on the right of the resource name. Resource Name of the resource assigned to the task. Rate (%) Rate planned for this resource to the task. Assigned The work initially planned for this resource to the task. Real Sum of work done by this resource to the task. Left Remaining work to this resource to complete the task. Click on the resource name to directly move to resource detail. Click on to assign a new resource. Click on to modify the assignment. Click on to delete the assignment. If real work exists for an assignment, it can not be deleted. Cost Daily cost defined for the resource and its function. Rate The max rate (%) to schedule the resource on the task by day. Assigned work The work initially planned for this resource to the task. Real work Sum of work done by this resource to the task. Left work Remaining work to this resource to complete the task. Reassessed work The new total work planned to complete the task. Comments Any comment on the allocation. The main function defined for the resource is the default function selected. Project leaders can adjust this value to estimate the work needed to complete the task by the resource. When a comment exists, will appear on the assignment list, and on the description of the activity on the “real work allocation” screen. Moving the mouse over the icon will display the comment. This section allows all at once, define planning and follow-up the progress. All planning elements have a progress section. Description of the different sections is grouped by the planning elements that have common fields and behavior. Progress data are displayed in the same format, but according to the planning element, fields can have another meaning or behavior. The following sections displayed first a general description of progress data. Next, description of fields and information in sections will be displayed. Requested dates allows to define initial dates (wished dates). Useful to define preliminary dates in a project, in a change request or other. as a first draft of planned dates. with indicators to monitor the respect of start and end dates. Validated data are used by project leader to define committed dates, work and cost expected. to fix a limit or a target and for some planning mode they are used to define parameter entries. with indicators to monitor the respect of start and end dates, work and cost expected. The validated end date allows to fix a due date at which the work must be completed. If the work is planned or completed beyond this limit, the error field will be highlighted. Planned dates are the estimated time to complete tasks or the estimated end date of milestones. Assigned work is the planned work assigned to resources for completing tasks. Planned dates are the estimated duration to complete tasks by resources according to assigned work. This column displays the planned work and cost of resources and the planned project expenses. Scheduled work time assigned to a resource for completing a task. The estimated cost is the scheduled work time assigned to a resource for completing a task multiplied by its current daily cost. Sum of the planned amount of all project expenses. This column displays the duration, completion date, work done and cost incurred by resources and the project expenses. Allows to determine when a planning element has really begun and completed. Work done by a resource on an assigned task. Work done are entered by resources, on a daily basis by real work allocation screen. The cost incurred is the work done by a resource on a task on daily base multiplied by its daily cost defined for the period. Sum of the real amount of all project expenses. This column displays the remaining of planned work and planned amount. Left work should be re-estimated by the resource. Scheduled work time assigned to resources for completing tasks minus the work done. The remaining cost is the remaining work by a resource on a task multiplied by the latest daily cost defined for it. Sum of the planned amount of project expenses not incurred yet. This column displays the resources work reassess and the spending projection. Work and cost from tasks (Activity, Test session and Meeting) are summarized for each parent element. Allows to follow-up progress on grouped tasks like phase, delivery, test group, sub-project and project. Consolidation can be done on validated work and cost. Allows to calculate the scheduled work and budgeted cost from lower planning elements. The calculation depends on consolidation method selected and on which level the validated values are entered. Values on the lower levels are consolidate up to project level. Zero values at lower levels do not overwrite values on upper level, but non-zero values on the lower level are consolidated up to project level. The parameter “Consolidated validated cost & work” in global parameters screen allows to select consolidation method. Project, Activity and Test session. These indicators can be programmed as a reminder and an alert, according to the number of days or hours before the start or end date. These indicators can be programmed as a reminder and an alert, according to percentage of progress on monitored value compared to the target value. The reassessed cost compared to budgeted (validated) cost. The reassessed cost compared to cost calculated from assigned work for resources. The reassessed work compared to scheduled (validated) work. The reassessed work compared to work assigned to resources. The work really done by resources compared to scheduled (validated) work. The work really done by resources compared to work assigned to resources. Next indicators defined for Milestone. These indicators can be programmed as a reminder and an alert, according to the number of days or hours before the end date. Next sections describe each part of progress section display. Some parts are used only by a specific planning element. Allows to define preliminary planned dates. Define entry parameters according to selected planning mode. Define initial planned dates, as a baseline. Fix a due date at which the work must be completed. The planned dates can be initialized with validated dates or requested dates (whether validated dates are not specified). The planned dates can be determined during the planning calculation. The planning calculation is done according to tasks assigned to resources and their predecessors. The planned dates of tasks will be calculated depending on their predecessors and their specified duration. At parent element level, dates are adjusted with the first planned start date and the last planned end date from all sub-elements. The planned start date is adjusted to the real start date when work began. The real start date is set when work began (handled). The real end date is set when no more remaining work (done). The real start date will be propagated to parent elements up to project. The real end date for parent element will be initialized, when all sub-element have been completed. Work of resources are calculated by the work assigned to each resource for tasks. Allows to define scheduled work and budgeted cost of resources. This value is used for calculation of the expected progress and project margin (work). This value is used for calculation of project margin (cost). The values of work and cost can be initialized with the sum of total work and amount of all project orders. Sum of planned work assigned to resources and estimated cost. Sum of work done by resources and cost incurred. Sum of estimated remaining work to complete tasks and ensuing costs. Left work should be re-evaluated by resource while entering the real work on real work allocation screen. Left work can also be changed on assignment, at project management level. Sum of resource total work that will be needed from start to end and the ensuing costs. Sum of work done on tickets and costs is included in work of activity linked through the “planning activity” of tickets. Sum of work done on tickets that don’t link to any activity will be integrated in the work of the project. Allows to set the budgeted cost of project expenses. Sum of “planned amount” for all expenses on project. Sum of “real amount” for all expenses on project. Project expenses not committed yet. Sum of “planned amount” for expenses for which “real amount” is not defined yet. Total is the sum of resources cost, expenses and reserve of their corresponding column. Calculated by the sum of the work done divided by sum of work reassessed. Calculated by the sum of the work done divided by scheduled work. Hierarchical position in the global planning. By default, the value is set to “500” (medium priority). The task is planned to finish as soon as possible. When two or more resources are assigned to the same task, planning tries to find periods where all resources are available to work together. Periods are searched “as soon as possible”. If only one resource is assigned, this planning mode is exactly the same as “As soon as possible”. If one resource is assigned more work than the other, the extra work is planned after working together periods. ** The validated start or end date field must be set. The task must not begin before a specific date. The task is planned backward from end to start. “Floating” backward planning is not possible, validated end date must be defined. Allows to evenly distribute work between two dates. Used for management recurrent activities. The validated dates fields must be set. Examples of the planning modes upcoming are based on 2 work days to plan on 10 days. Work will be evenly divided between on working days. For instance, 0.2 days during 10 days. Work will be distributed on full day between on working days. Work will be distributed on half of the day between on working days. Work will be distributed on one quarter of the day between on working days. The task is planned by duration. The task is “floating” depending on predecessors. The validated duration field must be set. It is not necessary to assign resources to the task. If work is assigned to the task, planning behavior is the same as “Regular between dates” but with floating task. If you want fixed duration with fixed start, use “Regular between dates”, or use milestone to define start. The percentage of remaining margins will be displayed on the right. Calculated by the scheduled work minus the sum of work reassessed. Calculated by the budgeted cost (resource & expense) minus the total of reassessed cost. Allows tracking of tickets attached to the activity throught the “planning activity” field of tickets. Number Number of tickets attached to the activity. Estimated Sum of estimated work for tickets attached to the activity. Real Sum of work done for tickets attached to the activity. Left Sum of remaining work for tickets attached to the activity. This field will be highlighted when the sum of estimated work on the tickets is higher than the planned work on the activity. 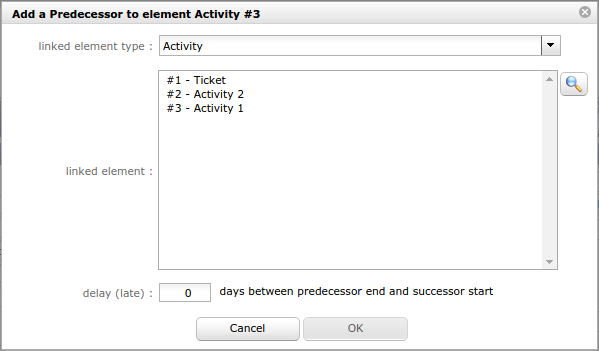 This field will be highlighted when the sum of remaining work on the tickets is higher than the remaining planned work on the activity. Click on to show ticket list attached to the activity. Click on a ticket name to directly move to it. This section allows to define planning and follow progress on a milestone. Allows to define the initial due date for the milestone. Have no impact on planning. Allows to define the due date at which the milestone must be completed. Defined according to the selected planning mode. Planned due date is the value from validated due date field. The milestone will not move, and may have successors. Calculation of planned due date takes into account dependencies with tasks. The milestone will move depending on predecessors. Determined when the status of the milestone is “done”. Hierarchical position of the milestone in the global planning. A milestone has no duration, so there are no start and end dates for a milestone, just a single date. This section allows to define priority and follow progress on a meeting. Allows to define scheduled work and budgeted cost. Used to consolidate validated work and cost to the project. Sum of planned work assigned to attendees and the planned cost. Sum of work done by attendees and the cost. Sum of planned work remaining and the remaining amount. Allows to define meeting priority. By default, the value is set to “1” (highest priority). This section allows to manage dependency links between planning elements. A dependency link can be created from a planning element (Predecessor) and to a planning element (Successor). The dependency link can be created in the Gantt chart. Element Type and id of the element. Name Name of the element. Status Actual status of the element. Click on the name of a predecessor or successor will directly move to it. Click on on the corresponding section to add a dependency link. Click on to edit the dependency link. Click on to delete the corresponding dependency link. Recursive loops are controlled on saving. By default, the list of values shows items of the same project. But, it is possible to link items from different projects. Click on to get the list of elements of all projects. Multi-line selection is possible using Control key while clicking. Days between predecessor end and successor start. This section allows to manage link between items of elements. Allows to associate items on different elements in the same project. A project can be linked with other. Click on an item name to directly move to it. If Item A is linked to Item B, Item B is automatically linked to Item A. A link between items has no impact on them treatment. Element Type and id of the linked element. Name Name of the linked element. Date Date of creation of the link. User User who created the link. Status Actual status of the linked element. Click to create a new link. Linked documents are available directly in linked elements list. A link with a document element offer the possibility to select a specific version. A direct link to version of the document is created. If the version is not specified, the last version will be selected. The download will transfer always the last version of the document. This section allows to attach files or hyperlinks to items of elements. Id Unique Id for the attachment. File File name or hyperlink. Date Date of creation of the attachment. User User who created the attachment. Select an attachment depends on whether is a file or a hyperlink. Click on to download attachment file. Click on to access to hyperlink. Document viewer available for files: image, text, PDF and hyperlinks. Click on to delete an attachment. Click on to add an attachment file to an item. 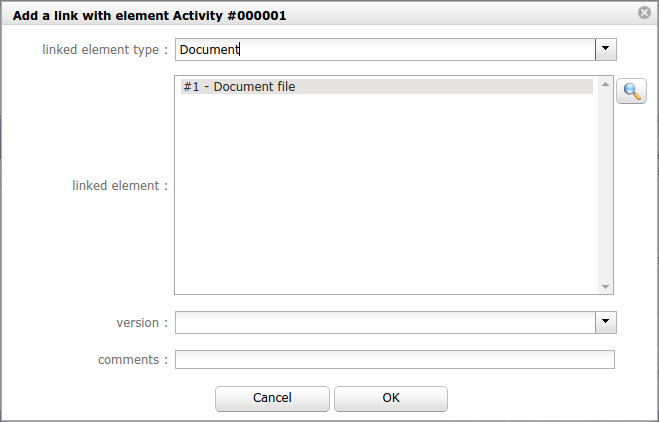 Dialog box “Attachment file” will be displayed. Click on to add hyperlink to an item. Dialog box “Hyperlink” will be displayed. Select file with “Browse” button or drop the file in “drop files here” area. Attached files are stored on server side. Attachments directory is defined in Global parameters screen. Enter hyperlink in «Hyperlink» field. Public Attachment is visible to anyone. Team Attachment is visible to every member of the creator’s team. Private Attachment is visible only to the creator. This section allows to add notes on items of elements. Notes are comments, that can be shared to track some information or progress. The list of values appears whether a predefined note exists for an element or an element type. 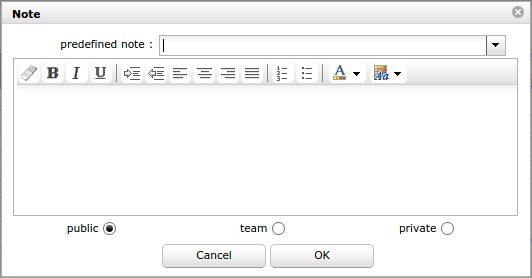 Selecting a predefined note will automatically fill in the note text field. Predefined notes are defined in Predefined notes screen. Team: Visible to every member of the creator’s team. Private: Visible only to the creator. Id Unique Id for the note. Note Text of the note. Date Date of creation or modification of the note. User Name of the user who created the note. Click on to add a note to an item.